Senses and memories come alive in a Persian garden. But is it possible to recapture that experience in Los Angeles? AT night, the scent of poet's jasmine woke me up. We slept outdoors, on wooden beds arranged next to the 12-foot-deep fish pool with statues of silver-skinned dolphins that spat water into the air when the fountain was turned on. Tehran's summers were dry and brutal. At midday, the heat nearly melted the asphalt on the sidewalk and turned the city into a ghost land. By 5 o'clock, the red bricks on the floor of our yard were still too hot to step on barefoot. At dusk, when the gardener hosed the ground, a thick cloud of steam rose off the bricks and made him invisible from the waist down. But at night, a cool breeze blew from the mountains to the north, luring us  my parents and grandparents, my two sisters and I  out of the house and into the garden. Around us, centuries-old maple trees rose into the star-filled sky until their tops disappeared from view. Ancient walnut and persimmon and mulberry trees  their bark rough and scaly, their branches gnarled, the ground beneath them splattered with fruit so ripe it fell off the tree and burst open of its own volition  cast eerie shadows in the dark. Flower beds  pansies and petunias, geraniums, pink Muhammadi roses so large, we had to use both hands to cup the flower  framed the lawn. Slender, mint-green vines of poet's jasmine covered every trellis. The vines had tiny white flowers  four or five petals, each as delicate as a butterfly's wings, with a fragrance at once subtle and pervasive, light and long lasting, and strongest at midnight. I remember it even now  the smell of poet's jasmine in our yard and on my hands and clothes, the way the silver shell of the dolphins looked blue in the moonlight, the smell of fresh mint at dawn, the clicking of the scissors as gardener Hassan pruned the roses in the early morning. Hassan came to work in a dark suit and a white dress shirt every day, and he acted as if this were normal, as if he didn't know that he was the only gardener anywhere in Tehran who dressed up like an English butler. He had done this since he was 12 years old  since his peasant father, who could not feed him, had "given" him to my grandfather for life. My grandfather had bought Hassan his first suit. In time, he would buy him his own house and even find him a wife  a mysterious woman who left home the morning after their wedding and never came back. Hassan was left alone with his suits, the life-sized statues of fallen kings and brave princes he had persuaded my grandfather to erect in the yard, and the Persian Garden he had raised and grown up in. 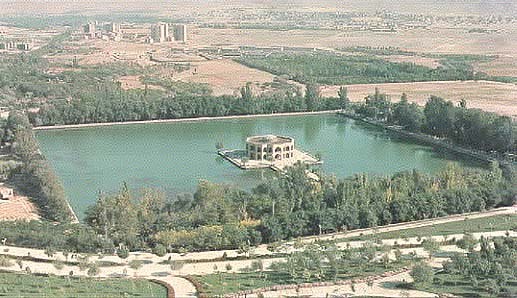 A typical Persian garden, ours was vast and many tiered, each tier built around a pool or fountain and boasting ancient, stalwart trees. In a country that is two-thirds desert, water represented both material wealth and spiritual awareness: you could look onto the calm surface of a pool, Persians believed, and see more than your outer image. Trees, too, were a symbol of veneration in Persia; tree-planting was considered a sacred profession. Persia's gardens gave the world the rose; an underground system of irrigation, called Qanat, that transported water for hundreds of miles through the desert; the fourfold pattern of quadrants that would inspire garden design from India to France, from Spain to Arabia. They were the stuff of many a poet's creation, a cultural icon that survived every devastating invasion and long-term foreign occupation. For my sisters and me, the garden was where we played cowboys and Indians every summer with our one male cousin: he carried both the guns, and the arrows and knives, because he was a boy, he said, and knew weapons. It was where we built snowmen in the winter by covering Hassan's beloved statues with snow and letting it freeze overnight, where we picked armloads of red and orange and yellow maple leaves from the ground in the fall, threw them into the air like a rain of colors, and stood as they descended back on us till our hair and skin was covered with their dust. I remember this  the ground covered by a carpet of leaves 3 inches thick; my mother crossing the yard in white patent-leather boots, a black coat, Jackie O pearls, giving Hassan instructions that he says he will follow only if he decides they make sense. Do me a favor, miss, and let me decide how to handle the peonies. Once, when all the peonies he had planted died in unseasonably warm weather, my sisters and I surrounded Hassan and asked him about his runaway wife. It had been many years, he said. He didn't remember her name, only that she had a loud laugh, and drank like a man. When last he saw her, she had worn a red dress too low in the neckline and too short in the hem. And she had no shoes on. She had told Hassan she was going to the corner store to buy a bottle of "rosewater," but people had seen her at the bus depot downtown, headed for God knows where, still with no shoes and no rosewater. PERSIAN rosewater was made in the city of Mashad, through a process of reverse osmosis that involved boiling pots full of Muhammadi rose petals and capturing the steam. It was used as an additive in food, a perfume for women, an air freshener. Its fragrance was strong and long-lasting  nothing like the watered-down, half-hearted version you'll find in Iranian and Arabic markets in Los Angeles. I keep thinking about this  the way rosewater was made in Iran, those giant pots of rose petals boiling till all the water had evaporated. I think about the little peasant girls who were sent into the mountains every spring to pick flowers and use them to dye the wool with which Persian rugs were made. I think about the way those colors never fade, the way the pigment serves to identify the origins of a rug, the region where it was made. I don't miss much about my life in Iran, but I do miss the colors, the flavors and textures, the old, tranquil gardens. I don't have a garden in L.A. but I know many Iranians who have tried to create, in America, the Persian gardens they abandoned in Iran. My friend Haleh Gabbay has planted native Iranian trees and flowers in her garden. Others convince themselves they can replace the maples with palms, the fountains with blue-bottom pools, the poet's jasmine with its weaker, less fragrant counterpart  common jasmine found here. But the roses that grow here barely have a scent, the sour cherries and persimmons have little flavor, the lesser jasmine cannot hold a candle to the real thing. My Iranian friends say it's the water  too much chalk and fluoride, and look how it makes your hair go limp, how it dries the skin and leaves that funny taste on your tongue. Or the light  it's too blurred, too white, too filtered through smog and fog and whatever else hangs over the city. Or the climate  not varied enough, not cold enough, not enough. I think it's something more than that  something we gave up when we traded the land of roses and nightingales, that magic kingdom asleep under an eternal spell, for the open vistas and new horizons of America. I think it's the soil that could tell a thousand tales, that had claimed the love and loyalty of countless generations. I think that's what made our gardens the places of enchantment they were. THE last time I saw Hassan, he was standing in our garden, next to a pomegranate tree that twice had been given up for dead, survived droughts and the evil eye of many an envious neighbor. He had known for more than a year that my parents and I were going to leave Iran, but he had never said a word about it or acted as if he cared. At the last minute, when my father went up to shake his hand, Hassan looked down and burst into tears. "You won't remember me," he told us that day. "Where you're going," he said, "the land has no memory." Apricots and pomegranates were Majid Jahanbin's favorites as a child growing up in the oil city of Abadan in the Persian Gulf. The agriculturist sells these as well as some lesser-known plants popular in his native Iran at his Paradise Nursery in Chatsworth. Persian, poet's or Spanish jasmine. The ancient Persian "yasman" became the English word for this fragrant plant. There are many kinds but the favorite in Iran is Jasminum officinale affine (sometimes sold as J. grandiflorum), with small white flowers that are powerfully perfumed, on the sultry side, warm and sweet and as good as scents get. Jahanbin said it blooms all the time here and is easy to grow. This fine-leaved, bushy vine must be tied to a trellis or wall support and will easily grow up to the eaves. Persian sour cherry and green plum. Some wince and crinkle their noses when they taste how sour these two fruits are, said Jahanbin, but Iranians love them  fresh or used in cooking. The cherry, above, is the smaller tree and has droopy branches so the fruit is easy to pick. The flowers make quite a show but, Jahanbin added, the fruit has good and not-so-good years in Southern California, much like apricots do. He explained they are grown in the snowy, mountainous north of Iran. The green plums are more reliable bearers. Both are deciduous trees that need some winter chill and adequate irrigation. Sweet lime. Also called sweet lemon. You might think it would be a sour fruit, but this nearly acid-free citrus is almost painfully sweet, so unlike a citrus that in a blind taste test no one would ever correctly guess it is one. Looks more like a thorny yellow Valencia orange and has few seeds; the fruit ripens in winter. Grown in the south of Iran, it does very well in Southern California if grown like any other citrus, given a warm spot in the garden, good soil and adequate irrigation, especially when young. Citrus do best when fallen leaves form a mulch. White or Tabriz mulberry. Mulberries are very popular in Iran, eaten fresh or dried and served with tea. The white variety is powerfully sweet and produces so much fruit it is sometimes a nuisance. There are also darker kinds called Persian mulberries, which are a red-black. All can become big deciduous trees, from 30 to 50 feet tall and wide, though they often stay small. White mulberries are one tough tree and will even thrive in our high desert, where they tolerate alkaline soils, or in difficult seacoast conditions. If winds are a problem, stake trees and shorten long branches. Surface roots make it nearly impossible to garden under a mulberry.